One of the cat’s most distinctive features are his claws. He can extend them in a flash to slash out at an enemy or to climb to safety. But misdirected, his claws can be a source of annoyance to his owner. Below are some hints to help you channel your cat’s claws in the right direction. To sharpen or condition the nails. A cat claws a rough surface to file his nails smooth, just as we use an emery board. To mark territory. A cat marks off an area, such as the inside of the house, to reassure himself that he has a safe place to exist. One way he brands his territory is by regularly clawing several spots in the area to leave both a visible and a scent mark. He also can mark territory by urination and by head or cheek rubbing. To exercise and have fun. Cats experience considerable pleasure and a sense of power from their feet and claws. They enjoy the act of clawing and derive some exercise from it as well. It’s fun to let ‘er rip! The three-point program below will work either to train a kitten or young cat or to re-train an adult cat that already has bad habits. Sit the cat in your lap as you would hold a baby and take a front foot between your thumb and forefinger. Gently press on the toes until the claws extend. You will see a dark red wedge-shaped vein running down through the transparent claw (see diagram #1). Just trim off the clear tip or cut just beyond where the nail curves the most. Do NOT cut into the vein. You could also ask your veterinarian to show you how to clip nails. For best results, you should practice extending the nails several different times before you actually clip them. You want to project an air of authority to your cat! You also can see a video of this process at the Cornell website http://partnersah.vet.cornell.edu/pet/cats. If you do happen to cut the quick, plunge the nail into a bar of soap to stop the bleeding, or wrap the nail in a cold compress. Or buy some Quik-Stop at the pet supply store. This product does not sting like styptic does. Remember, cats dislike being firmly restrained. Try to avoid a “death grip” on the cat. The more relaxed you are, the easier your job will be. Maybe only trim a few nails at a time and then stop. Keep the sessions fun since you will be doing this for the rest of the cat’s life. Some find that two people – one to hold and one to clip – make this easier. Adult cats need their front nails clipped every one to two weeks and their back nails trimmed less often. Kittens under four months of age may need to have their nails clipped as often as every four or five days. It is best to wake a kitten up or catch him when he is quiet so that he’ll cooperate. 2. 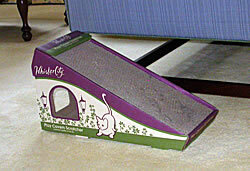 Buy or make two scratching posts which the cat will use. Your cat will claw something – it is up to you to find a place that is mutually acceptable to you and the cat. “But I have a scratching post and he won’t use it!” you say. Why not look at what is wrong with the post rather than what is wrong with the cat? 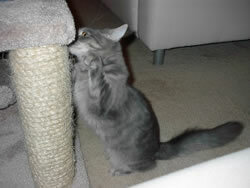 Many of the readily-available scratching posts are two feet tall, wobbly, and covered with shag carpet. Even an 8-week-old kitten cannot get a decent workout on a marvel of micro-engineering like that! Look at what your cat already is scratching – perhaps the sofa. The sofa is nice and tall, sturdy, and covered with a nubby tweed. Try to duplicate whatever he already is clawing in the scratching post you get. He wants a texture that he can get his claws into and meet with resistance. Soft carpeting does not appeal to cats – it appeals to owners! Another effective type of scratcher is made of corrugated paper (photo 4). These are blocks of corrugated paper laced with catnip which either are on a slant or lie flat on the floor horizontally. The cat sits on it and claws as he would on a tree root. When one side wears out, you turn the corrugated paper block over and expose the fresh side. Refills are available as well. These are very popular and inexpensive at the pet supply store. Other ideas include using a rough-barked log (either mounted on a platform or placed on its side), a wicker hamper, the jute backing of a carpet sample, and covering a door jamb or basement post with carpet. Location is vital, as with real estate! Put one post right beside the spot where the cat currently is clawing and put the other one near where he sleeps. Often the cat will stretch and claw just after awaking. Posts in different areas of the house will encourage him to mark territory in acceptable places. 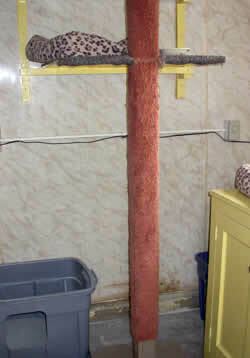 The posts can be different types, like a corrugated paper one by the sofa and a cat perch where he sleeps. 3. Train your cat to claw where he is supposed to. Put your cat on the new scratching post. If he gets the idea and claws, pet him and encourage him or give him a treat. 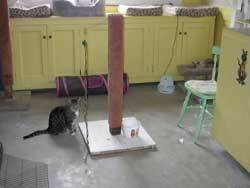 You can make the post more attractive by hanging a toy on it or rubbing it with catnip. Change the toy and refresh the catnip often. Play with your cat on the post. If your cat is clawing your upholstered furniture, buy a yard of clear Contact paper at the hardware store. Then cut large patches of the paper and stick them directly on the places on the furniture that the cat is clawing. This keeps him from freshening up the scent and visual marks he has been making. It also changes the texture of his favorite spots so they are less appealing. 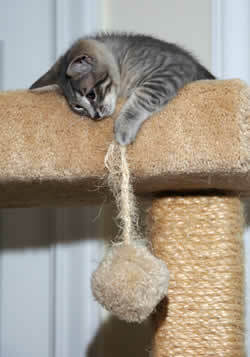 Place one of his scratching posts nearby so that you can “wean” him off the furniture and onto the post. You also can use double-sided sticky tape, sealing tape, or clear duct tape in place of the Contact paper to change the texture of the furniture. 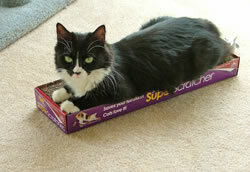 “Sticky Paws” is one commercially-available product for this purpose. If you catch the cat in the act, you can use a clean plant sprayer filled with water and set on “stream” as a squirt pistol. While he is in the act of clawing, run a few drops of water up his back and say nothing. Hopefully, he will think that the sofa or chair squirted him. A few shots like this and he will soon catch on that furniture-clawing is unpleasant. You can also try a noise deterrent like shaking a can of pennies or sounding a bell or buzzer (like your smoke detector) if you catch the cat in the act of clawing furniture. You don’t want the noise to be terrifying to the cat, only repellant. But this (and the water treatment, incidentally) must be done consistently at first so that the cat always gets the noise (or water) when he claws where he shouldn’t. Ideally, you will not acquire a kitten until he is about three or four months old, has already learned to use a scratching post, and has run off some of his kitten energy with his littermates. But, most likely, your kitten is a very immature two months old. Kittens at this age cause problems with their claws because they are too small to leap up to sit with you, so they shinny up the front of the sofa. Or they leap onto the dining room chair, overshoot their mark, and dig in to prevent falling off. Or they are so full of energy that you get scratched just trying to cuddle them. Basically, all you need to do is follow the three-point program already outlined above. But some kittens also climb drapes and furniture. If your kitten is a climber, it is important that you provide a tall post or climbing tree as soon as possible where he can channel these tendencies. To protect your drapes, make a “rug” of Contact paper placed sticky side up or use a vinyl carpet runner with the nubby side up where the kitten would have to stand to start up the drapes. Or wrap the bottoms of the drapes in dry cleaner bags until you feel the kitten has forgotten about climbing them. You could also temporarily cover your furniture. Drape you upholstered furniture with sheets or throws and tie them at the legs to be sure the kitten doesn’t crawl up underneath. 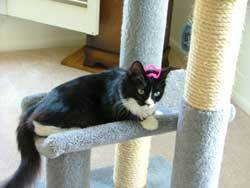 Lay magazines or newspaper sections on wood chairs or tables where the kitten is likely to jump. Obviously, you do not want to live like this forever. But these steps will protect your furniture until the kitten has matured some. People with babies and even puppies must take steps to protect the house. Kittens go through a destructive childhood, too, only it is not as well publicized or accepted! WHY NOT JUST DECLAW THE CAT? If you follow the steps recommended above, declawing your cat is not necessary. Why do unnecessary, irreversible, costly, and possibly dangerous surgery just to correct a training problem? 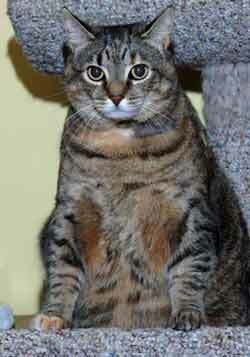 Clawing behavior is one of the easiest cat behavior problems to correct. When a cat is declawed, the veterinarian anesthetizes the cat and amputates the last joint of each toe. Most people believe that only the claw is removed, but this is not true. The claw grows from the bone, so the bone must be removed to prevent the claw from re-growing. This is like amputating your finger at the first joint where your nails are. The healing process can be plagued with complications such as hemorrhage, infection, bone chips which prevent healing or cause abnormal nail re-growth, painful neuromas where nerves are cut, painful contracture of the tendons, chronic neuropathic or phantom pain, and arthritis later in life. Prolonged lameness was reported in nearly 20% of 121 cats who were followed post-declawing in one study. The cat also is no longer able to balance quite as he used to. Removing this third phalanx causes adverse biomechanical changes in the foot and causes the cat to balance more towards the back of his body than normal. Most veterinarians also recommend that declawed cats be kept indoors because they no longer are as able to defend themselves or get to safety. Many veterinarians refuse to perform the surgery because they feel it is unwarranted elective surgery that has no benefit for the cat – it is done merely for the owner’s convenience. The Cat Fanciers’ Association, the American Association of Feline Practitioners, and the American Veterinary Medical Association have written position papers and agree that this surgery should not be performed unless certain criteria are met, such as owners with immune compromise or bleeding disorders. Indeed, the declawing procedure is illegal in many countries in the world such as Great Britain. There can be emotional complications from declawing, too. Nature endowed the cat with claws as a first line of defense and escape. It stands to reason that if you tamper with such a vital survival mechanism, there will be emotional repercussions. In one study, 33% of 39 cats that were declawed developed at least one behavior change immediately after the surgery, with the most common being litter pan problems and biting. The cat knows he has no claws, so he resorts to biting. The litter pan connection may be due to the veterinarian requiring that the cat’s litter pan filler be changed temporarily to shredded newspaper to accommodate the healing paws. Or possibly, since the cat can’t mark territory to reassure himself with his claws any more, he resorts to urine marking. Declawing can lead to worse problems than it solves. People may feel that it isn’t fair to their already-declawed cat to get a second cat that is not declawed. I have taken in declawed stray cats (let’s hear it for those declawed cats being kept indoors!) and they have done quite well with my group of non-declawed cats. When cats fight with each other, they bite more than they claw. 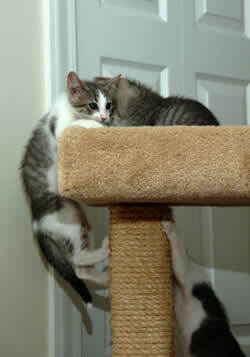 Once the cats know and accept each other, there is very little fighting so the claws are not a problem. Tenectomy (or tendonectomy) is a procedure in which the tendon is cut to prevent the cat from extending his claws. The claws still need to be trimmed regularly which is not easy because the usual mechanism that allows you to extend the claw to trim has been disrupted. The nails seem to grow abnormally in many cats after a while. The extensor tendons contract, which seems to cause pain in a fair number of cats. One study which followed a group of tenectomized cats showed that owners tended to less satisfied with long-term results than owners of declawed cats. They cited abnormal nail growth, lameness, the need to trim nails, and continued clawing behavior as their reasons for being dissatisfied. These are the reasons the American Association of Feline Practitioners and the American Veterinary Medical Association recommend against tenectomy. 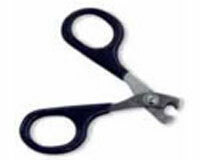 Many people have heard that laser surgery is superior to regular blade surgery for declawing. Laser surgery causes less bleeding and swelling than traditional techniques. It seals off blood vessels and nerves as it cuts. This results in less pain and fewer complications in the first few days after surgery. BUT the long-term consequences of the surgery are the same – lameness, chronic pain, abnormal nail re-growth, and so on. I CAN’T TRIM NAILS AND DON’T LIKE CLAWS. WHAT CAN I DO? A product called Soft-Paws may be the answer for you. These are plastic nail coverings which are glued to your cat’s claws with a safe adhesive and provide a blunt surface to the nails so that scratching does not cause damage. 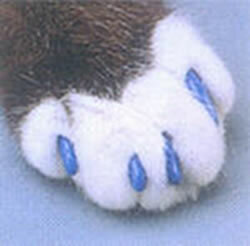 These grow out with your cat’s nails, so they must be replaced about once every 4 to 6 weeks. You remove the caps, clip the nails, and replace the caps. If you aren’t adept at this, you can have this done at your veterinarian’s or grooming establishment. These plastic nail caps are available at most pet supply shops and on-line. They even come in colors. As I sought to update this pamphlet which I wrote originally in 1982, I researched declawing on my Veterinary Information Network (VIN) and what I read truly gave me pause. My chief objection always has been post-operative pain. In the past, I have watched these cats come out of anesthesia thrashing from the pain. Today we have amazing analgesics for use in cats, so that objection has been satisfied. But I found a staggering number of inquiries from veterinarians to the specialists inquiring about post-operative complications – lameness, pain lasting months to years, grumpy cats, abnormal nail re-growth – occurring with every kind of declawing procedure – blade method, tenectomy, and laser surgery as well. My conclusion is that your veterinarian can’t guarantee that YOUR cat will come through the procedure unscathed. 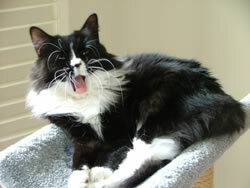 Statistically, your cat probably will not have any long-term problems with the procedure. But can you live with yourself if he does? People who have their cats declawed usually do not understand how important physically or emotionally the claws are to the cat. Declawing your cat is like the ultimate rejection of part of what makes him a cat. Cats have claws for a reason! With a little work and commitment to your cat’s welfare, you will eliminate the excuse to declaw you cat and make him a better pet as well.